You are here: Home » Happy birthday Liz! It was a night that had been carefully orchestrated for weeks – a surprise (early) birthday dinner for a friend! My contribution was as driver of the unknowing birthday girl and supplier of cake. Mmmm cake. If you’re wondering – it all worked out beautifully! It was so wonderful to see such genuine emotion for the guest of honor and friends – true joy, surprise, and happiness on everyone’s faces! 😀 We had a delicious dinner (go team Left-Side-of-Table!!) 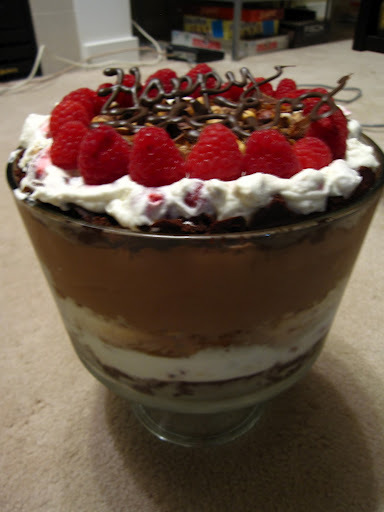 and it was topped off with a surprise birthday trifle. 1) Extremely easy to transport. 2) Saved me the trouble of icing & decorating the sides. 3) If layered well – extremely beautiful. I made additional berry sauce to top off the cake – apologies in advance for the blurry photos – I was in a bit of a rush and took it whilst sitting on my living room floor! I kept in mind that Liz adores my zuccotto – so the ‘white’ filling is comprised of whipped cream with fresh raspberries, toffee candy bits, and whole toasted hazelnuts folded in. The over-powering brown layer is an orange chocolate mousse (I didn’t realize I had made so much & didn’t want leftovers!). The layers are alternated with dark chocolate and vanilla cake. 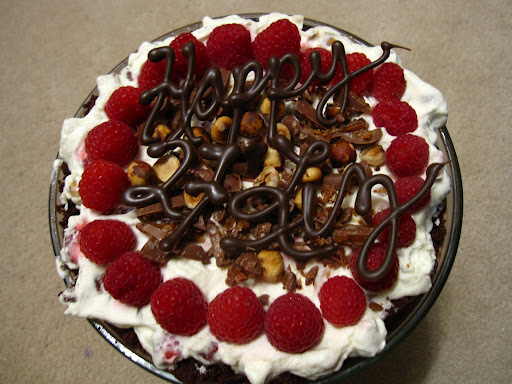 The whole shebang is topped with more whipped cream filling, raspberries & some decorative writing. I had some great feedback from the writing – and here is my secret: it’s candy melts. Dark chocolate flavoured. Candy melts are amazing to use in an aesthetic setting – it flows like chocolate, tastes like chocolate and hardens in a flash. Also – it’s much less sensitive to temperature! So while it does melt in your hand, it’s not going to disintegrate or sweat at the thought of hot lights. Even though they are an amazing medium to use – do not use them in cookies! Let me rephrase that – they are not suitable for cakes or cookies or to melt to be used in brownies (or cake). There is a reason why they are called ‘candy melts’! They are not chocolate! So if you need to make some decorations for cakes or pastries, I highly recommend candy melts. They also come in a variety of colours too (you can tint the white candy melts, but sometimes they come out a bit chalky, so if it matters to you – try and source the coloured melts). Yum! So it's not chocolate but its chocolate flavored? What are the candy melts made of? I also am curious as to what candy melts are. Also, the photos turned out great! I'm so glad you took photos to document that amazing dessert. Julien and I still talk about the deliciousness… *drool*… Thanks again for making it!